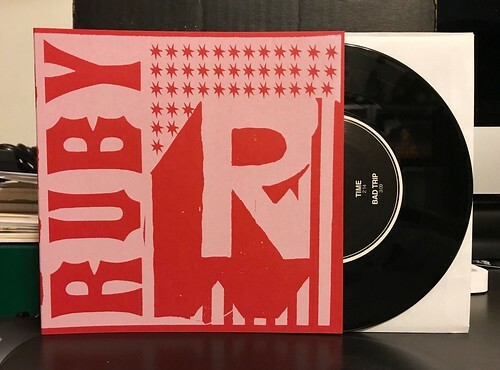 I Buy Way Too Many Records Dot Com: Ruby - Deadlock 7"
I was pretty excited to stumble across this Ruby 7" (along with a one-sided 12" that I'll be writing about soon enough). Ruby is fronted by Andi, who was also in favorites of mine like Blank Pages and Idle Hands. I was bummed when each of those previous bands split up, so it was good to see a new project come forward. The best part? Ruby essentially sounds the same as Blank Pages, who pretty much sounded the same as Idle Hands as well. I realize that's a sloppy comparison, particularly as one of the songs has a completely different singer and there are a lot more backing vocals and harmonies than either of Andi's previous bands. The truth is I love all three as they bring the sort of fast paced, jangly guitar sort of power pop that I go crazy for. Imaging the hooks and downstroke madness of the Marked Men, but peel away the guitar distortion and you've sort of got Ruby. I did have to order this and the 12" from overseas, so the cost is a bit higher when you factor in postage, but this is definitely one of the better 7"s I've heard this years. It's worth picking up and I hope that I'll be hearing more from Ruby very soon.